Late September we need Fan Man on the Tube? It's the end of September but we need FanMan. It might look like FanMan is about elbow the woman in the face, but apparently he has cooling equipment in his sleeves. The Emmi FanMan, was a six-foot fan-wielding super-hero, using "state of the art technology to blast those around him with a refreshing jet of cool air" . Sadly this was just a summer stunt but we could really do with him today as temperatures are expected to rise to 29 degrees in London. Emmi FanMan said "I’m just someone who wanted to make a difference. In a world where heat exhaustion, dehydration and profuse sweating are rife I knew I couldn’t just stand by and watch any longer. Commuting is an exhausting business but coupled with the crippling heat of a packed tube carriage it becomes unbearable. I’m there for people in their time of need." Wonder how the Piccadilly, Northern, Central, Bakerloo and Waterloo and City lines will be faring today? These lines are marked as high risk on a LU "Passenger heat strain" map. They're the lines that are the highest risk to people should they become stuck on a stalled train. You've probably been hearing a ton of press about Facebook's new Timeline and all of the recent changes they've made to the layout of the page. It might surprise some of you to know that I'm even on Facebook (I'm here), as I never really make a big thing about my presence there. However, the new Timeline is making me re-think how I use Facebook. I watched the live feed of the Facebook F8 Developers conference last week and was seriously impressed. I have to use Facebook a lot for work, so that's why I was in the office until 8pm watching it. Here are my tweets while I was watching F8 at the time. 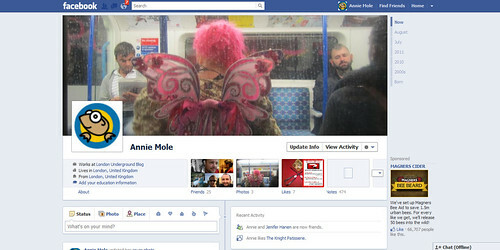 As "Annie Mole" I could never really see the point of doing much on Facebook. I actually thought it would take page views away from my blog & having my own "real me" Facebook account as well, AND a Twitter account was quite enough. I wanted Facebook to be the only social network that was about the "real me" and everyone I friended on that "real me" account were people I've met and like in real life or people that I've worked with over the years. The only reason I joined Facebook in November 2007 was to Like a few Tube related groups I was interested in. If you have got the new Facebook Timeline (it rolls out in a few weeks), you'll be able to see my first comments on Facebook were "is wondering about having a Facebook profile" - November 30th 2007 - Some people then found me and wanted to friend me. I didn't really respond as I felt I had enough with the blog & Twitter. By 2008 I thought that was a bit rude, accepted a few friends, but still found it all too much so said "wants you to email her by the usual channels if you want to talk to her"
People still kept finding me on Facebook & tried to friend me. I still kept saying on status updates "I deliberately have no Facebook friends please email me if you wish to talk to me". Still people kept trying to friend me, so I gave up and thought, "OK will just pull in feeds from my blog as notes and that should do it". That seemed to work for years and I still made the odd status update like "Please note I don't actively use Facebook, so it may take some time before I get back to you if you contact me here! Best to email me - thanks :-)"
Now I am re-thinking. The Facebook Timeline will allow me to very easily build an online scrapbook of Annie Mole's life since conception in 1999 to the present day. Obviously the "real me" is much older (it was my birthday on Saturday - thanks to those who came to my party), and I'm not sure if I can be bothered to scan in baby photos and update every significant event in my life. I'm over 40, that's quite a lot to add. However, since building my Timeline profile yesterday, I saw that you could actually just start from the day that you joined Facebook and you didn't have to go back to your actual date of birth. I tweeted at the time of the Facebook Developer's Conference that their VP of Product Management - Chris Cox was to me the most impressive speaker. I still cannot find a video of his speech, so the following badly filmed, and hardly viewed video will have to do - listen to it or watch it - it's only about six minutes long. It explains Facebook's thinking from November 2010 almost a year before they made the announcements about Timeline. They've been thinking about this for a long time, way before Google+ existed. I studied Sociology at University. I'm a massive people watcher. I socialise a lot. None of these are big secrets or surprises. The internet has massively enabled me to socialise much, much, more than I could ever have done without it. Rather than being a blogger hunched over my computer and never going out it enabled me to meet so many interesting people. People I seriously would have never met without the internet. People who are now some of my best & closest friends. 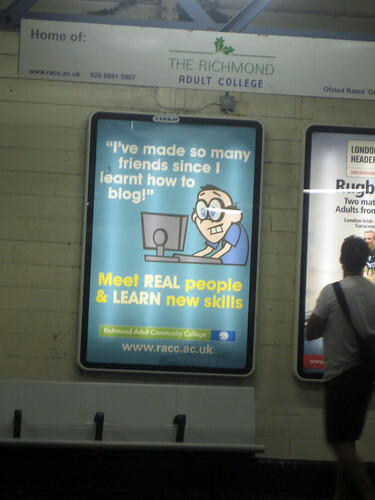 Yes Richmond College us bloggers don't all look like that. To me, Facebook Timeline allows you to make the most out of the significant "Third Space" ("Home" & "Work" being the other two) - ie The Third Space is all of the many, many spaces where we socialise & meet people outside of work and home. It allows us to have one online space to store our collective memories of all those things we do with friends, family, colleagues, strangers, and all of our achievements within those spaces. It's entirely up to you how much you decide to display and share - Facebook will cleverly pull in some stuff it thinks is significant, but you can choose to hide those items from your Timeline. It will certainly mean that when the day comes that I no longer write this blog, when I'm much older and much greyer and not using the Tube, at least I'll be able to look back at one page and say "Yes that's what I did for 10 or twenty years or thirty years". So thanks Facebook, I think I finally owe you one. Can you answer these little known Tube facts? Gentle quiz for Monday, mostly inspired by someone who inspired a post last week (can't give the person's name away yet, otherwise it would make the quiz much easier). 1. How many stations have the colour of their line in their name and what are they? 2. 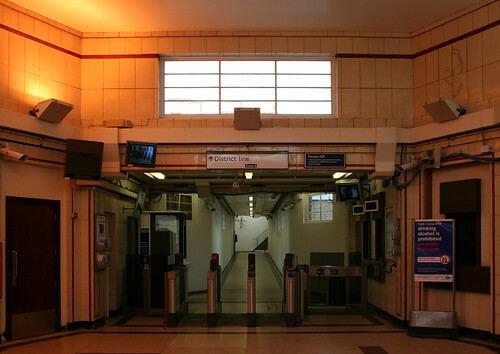 What's the eastern most station London Underground station that's entirely below ground? 3. What's unique about Upminster Bridge Station? 4. What's unique about Tottenham Hale Tube Station? 5. How many Tube stations have the word London in their name & what are they? This is just for fun and there's no prizes for guessing the most correctly. Leave your answers in the comments below and try not to look at the answers before you when you comment. Also try not to look at the Tube map either. I'll reveal the answers sometime this weekend. Another in the series where I ask you to try to guess from exactly where on the London Underground, the following picture in the London Tube Flickr group was taken from. The last Guess Where Tube 9 is still not closed and I'll reveal the answer over the weekend for those who want to guess. 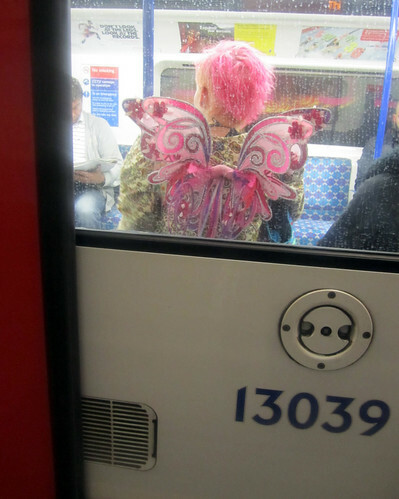 This week try to guess the exact location of where I spotted this lovely pink fairy on the London Underground, earlier in the week. The line is pretty obvious but I need the station and ideally the platform direction. I think it's tough. And try not to look at the comments in front of you before making your guess. Yet again, there's no prizes for getting it right, just the satisfaction of knowing you were right. Last night I sat opposite a woman reading @WalkTheLinesLDN's book Walk the Lines on the London Underground. 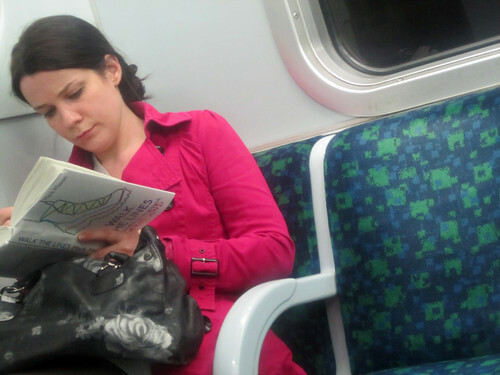 I love it when I see people reading books that I've read on the Tube and always want to say "look I'm reading this" or "what did you think of XYZ"? I never do though (OK I did once, but they were sitting right next to me and we were both reading "Wind Up Bird Chronicle" one of my favourite books of all time. Anyone who reads anything by Haruki Murakami rocks in my book). I really enjoyed seeing this woman reading Walk the Lines (it's about walking the whole of the London Undeground, overground) as I had interviewed the book's author, Mark Mason, for the blog and we had a lovely conversation on the phone about tons of Tube stuff - some of which didn't even get into the book. The temptation to say "I've interviewed him for blog, he's awesome" was overpowering, but she was so engrossed in the book, I really didn't want to disturb her. Do you ever give a secret wink or smile inside when you see people on the Tube reading the same book as you? 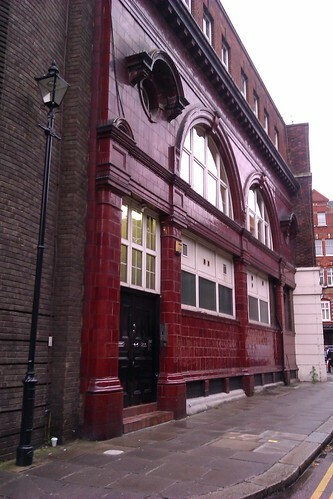 Great spot by @byekitty who noticed a weird destination at Pimlico London Underground station. 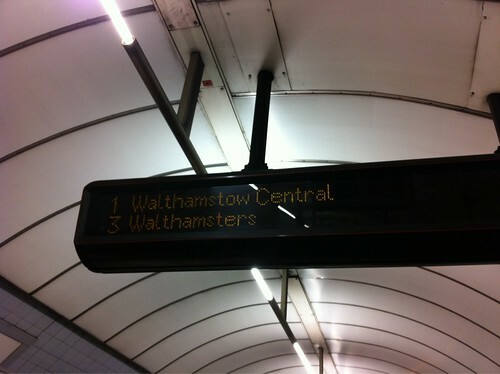 The first train was going to Walthamstow Central, the third was bound for a rather different destination. This stop wouldn't be too out of place in Neil Gaiman's Neverwhere, home of King Rats on the Tube. Hat tip to @minty83 who found this Tweet originally. 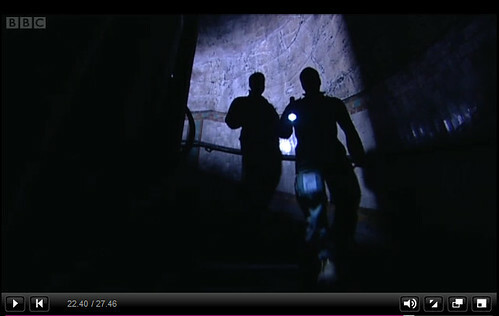 Love the scene in the video below that IanVisits kindly sent my way. It's for an old ad for Nokia but it was only recently uploaded to Vimeo. Nokia - Slacker from Sparks. 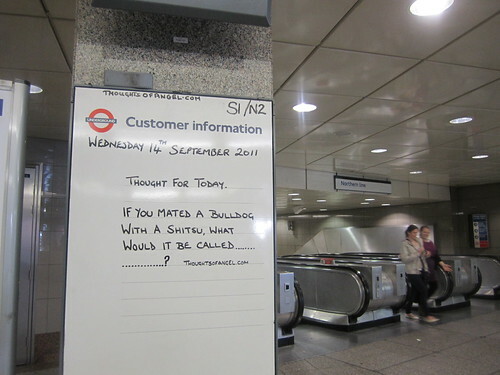 How often have you seen people having a domestic argument on the London Underground? Obviously it wouldn't be like this, but the people's reaction (or lack of) is interesting. Can you name this man? 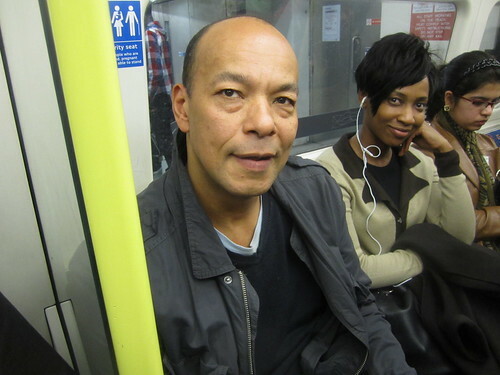 It's another time where I'm in the position to spot a celebrity on the London Underground and as with Stewart Lee, this guy kindly let me take his picture, with the air of slight confusion when I say "I write a blog about the Tube". I don't know what it is about Angel Tube, but that's where I also spotted Stewart Lee. Anyways the story to this, is that I got on at Angel London Underground about to go to a food blogger's event. I had a load of bags and stood by this guy as there were no seats. He very kindly offered me a seat, but I said no thanks, I'm only going one stop. His face already looked familar to me. His voice made think "Where do I know you from"? He pulled out a little red Moleskin notebook and started writing in it. I'm pretty nosy on the Tube at the best of times, but as I already thought I knew who he might be, I looked for evidence in his notes. Initially he seemed to have been writing a lot of numbers, then he started writing, sentences with a person's name appearing quite a lot in his notes. He could obviously tell I was studying the notebook in this lap. So I said "Excuse me but are you XXXXXXX XXXXX?" (this is for those who still want to guess who he is). He said "Yes, I am, who are you? Where do I know you from?" I was quite shocked by that and said "Errr you don't". He said "So how do you know me?" I said "I'm an old fan!". He looked pleased. "What's your name?" he said. "It's Annie, I write a blog about the Tube". "Really?" he replied. "Yes," I said "Do you mind if I take your picture for my blog". "Ummm no, go ahead" he replied with the usual bemusement. I took his picture. He then asked how would he be able to see it and I hurriedly told him my Twitter name which he noted in his notebook, just before I got off for my stop. So there you have it. Do you know who is he? If you're of a certain age, you'll probably get it very quickly. I'll reveal the answer later on Friday and in the meantime, have fun guessing. Update - Well a number of you have got it already. So revealing much earlier than I thought. It was Roland Gift from The Fine Young Cannibals. He was named in People magazine as being one of the 50 Most Beautiful People on the Planet, was on the cover of Rolling Stone and has an AMAZING voice. I was obviously gobsmacked to be having the above conversation with him on the Tube and humbled he was surprised someone recognized him. Roland really hope you see this post and thanks for being so lovely and letting me take your photo for the blog. 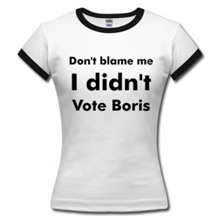 Guys you have surpassed yourself and gave me the best laugh of the morning. Guess Where Tube 10 - Gate? Continuing the series where I ask you to try to guess from exactly where on the London Underground, the following picture in the London Tube Flickr group was taken from. I was obviously too easy with the last one - Guess Where Tube 9 as I felt sad that only one of you guessed the exact specfic location of Guess Where Tube 8. Now, no mercy, this week's is really hard again. 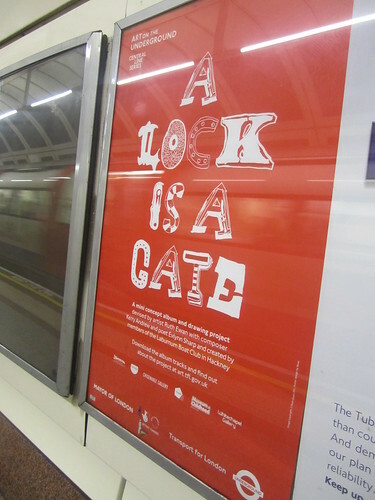 I need you to give the exact location of where I took this picture of one of the Art on The Underground series of posters - A Lock is A Gate. And try not to look at the comments in front of you before making your guess. Over the weekend I travelled down to Brighton to attend BarCampBrighton, a fantastic two day "unconference" as part of September's month long Brighton Digital Festival. I had two heads on and had planned to speak as @anniemole and as @gbchefs (my day job at Great British Chefs where I am Head of Social Media and we were one of the sponsors). I love Brighton and although Brightonians would probably scowl to hear it called London by the Sea - essentially it is! 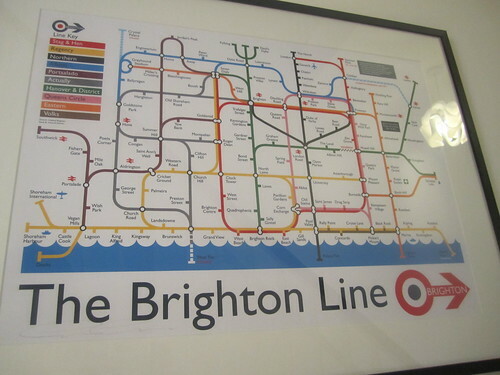 I stayed the night at my friends who had a fab map in their hallway, "The Brighton Line" with the various streets and areas of Brighton, mapped out like a London Underground map. If you're from Brighton, apparently it's pretty accurate, with its Stag & Hen line (Brighton's still a popular spot for Stag & Hen parties) and the Northern Line running from "The North", (one stop north of London) to "Palace Pier" in the sea. It was a fairly geeky weekend and although I still can't really get my head around the idea that I'm a geek, I spose I am. Anyway, the geeks and techies amongst you may be interested to hear that London Transport Museum are holding a Hack Day this coming Saturday, 17th September. "Love of facts, stats, data and great design? Release your inner geek and delve into the beautiful and immersive world of data visualisation with onedotzero and Protein. Following a brief introduction about how to data visualise, where to find data and what to do with it, participants will be given a set of data, inspired by the Museum’s new exhibition Sense and the City: smart, connected and on the move. You will then go on to produce a graphic output that displays the material in a way that is interesting and visually appealing. Designers, developers, techies and competent amateurs are all welcome. Presented by London Transport Museum in partnership with onedotzero." This sounds amazing and I will certainly be going along as a "competant amateur". You must bring along your own laptop. The day runs from 10am until 4pm and costs £25 (£23 concesssions) but this does include full entry in to London Transport Museum for a year plus refreshments. You can book Online or telephone London Transport Museum on 020 7565 7298. Finally for those who want a idea of all the amazing stuff that went on over the two days of Bar Camp Brighton, here's my "Storify" summary of the weekend. It's really touching that I'm still getting emails asking about Bob & James, mainly since Bob the Angel Tube Cat & his Big Issue owner getting a a book deal and got featured on Catster's blog (Catster's a massive online community for cats). 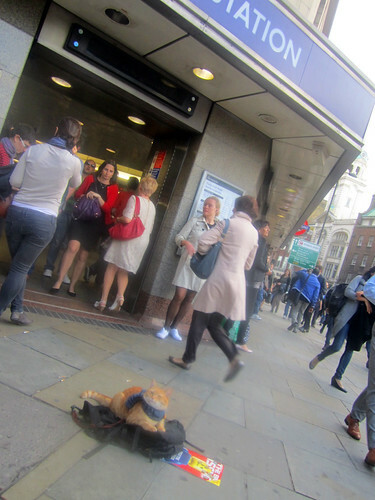 Last night I saw Bob and James happily playing outside Angel London Underground station. James now has a launch party date of March 14th or 15th 2012 from his book publishers, Hodder & Stoughton, as they are hoping to publish the book in time for Mother's Day next year. 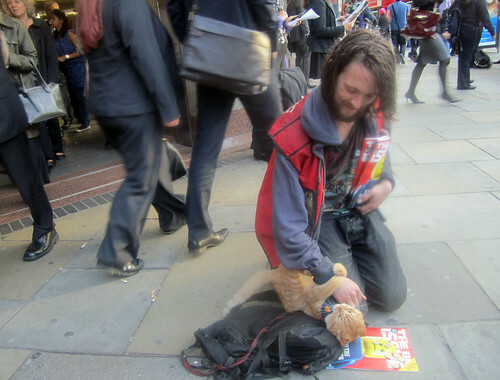 There's more lovely photos of Bob and James's in the Bob the Big Issue Cat & James Flickr Group. 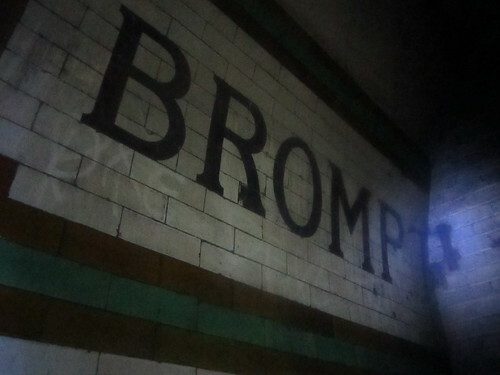 I was luckily given a second chance at attending a tour of "ghost" London Underground Station, Brompton Road. This time Ajit Chambers of the Old London Underground company gave me more notice, so I jumped at the chance and simply had one of the most fascinating tours of the London Underground ever. 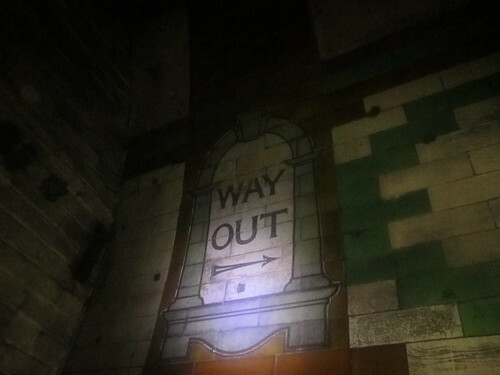 Regular readers of this blog will know that Ajit Chambers has a quest to try to re-open many of London's disused underground stations. He's been laughed at, told it was logistically impossible, a waste of money, a white elephant, a security nightmare and a 101 other things that people probably said to Tim Berners-Lee when he first tried to explain the idea of a World Wide Web to people. Chambers has the dogged determination that I admire in people who try to think outside of the box. I like people who take an idea that is actually quite simple (yet others want to complicate) and find a way of making that idea happen. That sort determination takes a lot of late nights, a lot of sleepless nights, a lot of knocking on doors, a lot of time scratching your head and thinking "what if?" 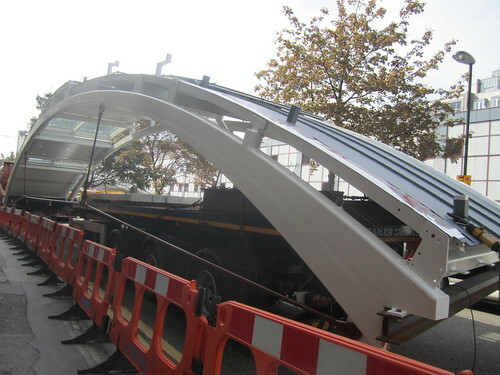 and just a few willing people to buy into your idea and say "actually that might work if we do this"
This is basically what has happened with Brompton Road. The building is actually owned by the Ministry of Defence. They bought it from London Underground in 1934 when the station was closed to .... err .... lack of interest. The Ministry of Defence now use the upper floors of the building as their London HQ for the Royal Naval Unit and the University of London Air Squadron. 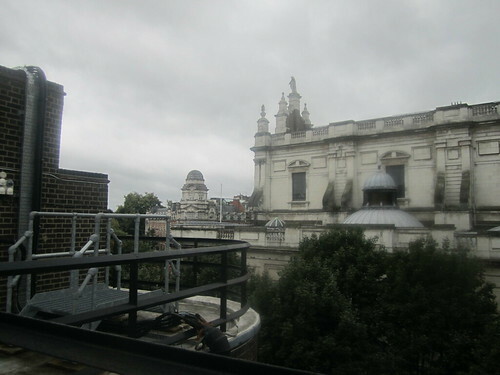 There is an enormous rooftop area with stunning and unique views across London, which they have used for parties in the past. This was the first part of today's tour and the MoD's business development manager explained the potential of the rooftop as a place for an amazing outdoor bar or restaurant. 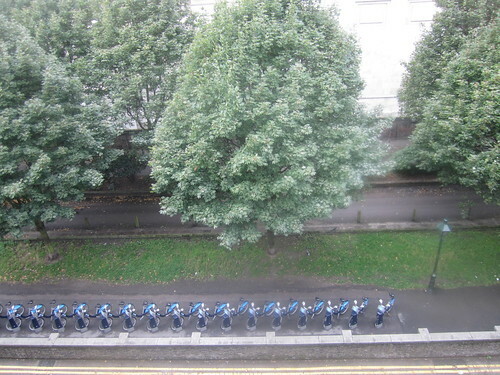 You get a great birds eye view of a Barclays Bike rank too. 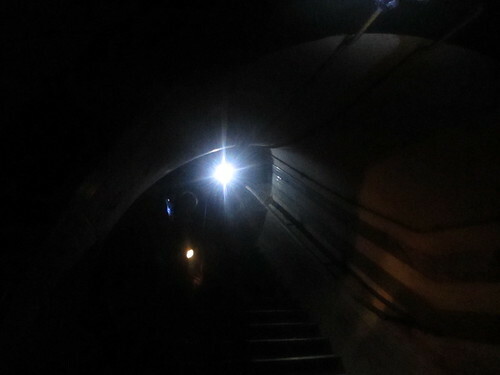 We were then gradually taken down to the innards of the station, through stairways literally covered in dust and soot. 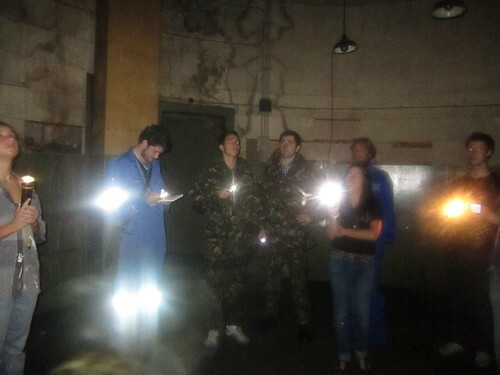 The fact that the MoD used these underground chambers and rooms for secret stuff made our trip even more fascinating. Everywhere you looked there were hidden rooms, with scary signs on doors telling you to keep out. It was like being part of the TV set of Torchwood, or Dr Who or the film set of Tube "horror" films Creep or Death Line aka Raw Meat. There was also a distinct feeling there would be some undiscovered Steampunk geekery at every turn. I still have no idea what half the rooms were used for, as I was sucking in the atmosphere of being in a hidden underground place that very few other people had stepped in. I had no idea what was ahead of me. 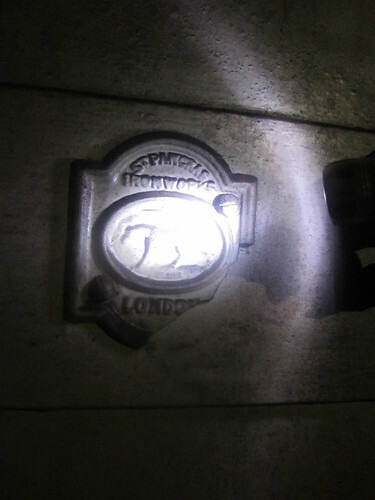 I knew that we would be going to the old station platform soon and I knew that there were parts of Brompton Road where you could see Piccadilly Line trains running between South Kensington and Knightsbridge stations. The closer to platform level we got the signs became less scary and more London Underground related. But many were still covered in thick soot. When we finally got to the part of station where the trains ran beneath our feet, we could feel the rush of air, the approaching rumble, the smell and heat from the trains. At platform level we saw the familiar tiles still seen at some London Underground stations on the Piccadilly Line, except here they were covered in soot and dust. It really is impossible to give a real sense of the tour in words and pictures alone. I've been on tours of underground caves in the French Pyrenees, in the Greek islands, in Bali and closer to home, tours of the Cheddar Gorge and Wookey Hole Caves. They all have that sense of stepping into the unknown, of slight claustrophobia, of worrying what you might bump into next and of sheer amazement and enjoyment. This was no different except it was only a short Tube ride from where I live. 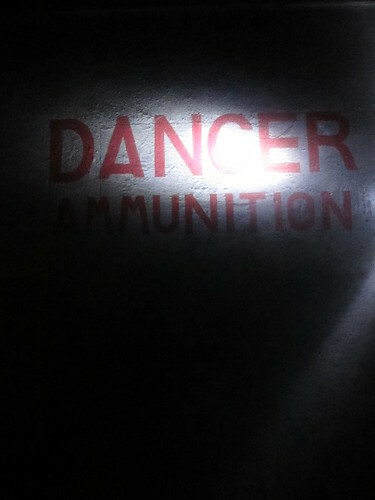 I tried to use as little flash as possible when taking these pictures, to give you a feel of the darkness and mystery. Chambers and the Ministry of Defence are working together to open the venue for public tours before the Olympics and I imagine it will be a roaring success. I for one, will be up for doing it again. The rest of my pictures from the Brompton Road Tube Tour are in my Flickr set and there's here a couple of pictures of the tour briefing which I Tweeted at the start of the tour. The BBC were filming some of the tour while we were there and it was BBC London News on 7th September - you can view the video on the BBC's page on Brompton Road. Thanks so much to Ajit for inviting me to this amazing tour and I wish him the best of luck with explaining the concept to Boris Johnson tomorrow. Watch this space to see whether he gets given the go ahead to for the re-opening of stations actually owned by London Underground themselves. Guess Where Tube 9 - Bridge? With the last one only one person got the exact specfic location Guess Where Tube 8. So it looks like this time I have to be even easier on you. As with previous weeks, I'll say it's one where if you really know where it is, you'll get it straight away. If you don't it will be harder. This is pretty easy though, so please, if you can, give the street name from where I was when I took the picture, to be most exact. And try not to look at the comments in front of you before making your guess.